Sports psychology researchers often look to understand the impact of various elements on how well an athlete is able to perform. It could be traits such as levels of confidence or optimism, skills used such as imagery or resilience or environmental factors like the type of coach or the support mechanisms they rely upon. One of the key environmental factors found to impact on a range of elements such as injury levels, the ability to deal with stress (literally acting as a stress buffer) and levels of satisfaction is ‘Social Support’. The people in your life who, in times of trouble or stress, can get you back on track and make life a little bit easier and more inspiring. Not in a ‘take you out drinking’ kind of way (though that is always welcomed!) but in a ‘you can be all that you want to be’ kind of way. Here are the four that I think everyone needs in their armoury. The mentor – often this is a former manager or a sports coach you really bonded with. They trust in your abilities, let you fly out independently, but are always there when you need to wave a white flag and ask for help. Advising you when your personality gets the better of your professionalism but nevertheless constantly being your champion. The cheerleader – they will remind you not how far you have to go, but how far you have come. And they will celebrate that for you, on your behalf. Not because they steal the limelight but because they want your star to shine brighter. People who tell you out loud that you are amazing and that they are proud of you are gold dust. Find one and grab hold tight. And be that someone for someone else. The one who has it all. We all know someone who is amazing. They have it all. Great job, lovely partner, gorgeous kids and they are fit and healthy. And usually annoying good looking too! They have the life you’d love. And then they trust you enough to admit that life isn’t as perfect as it seems. That they haven’t slept in weeks, that sometimes it all feels like a massive struggle. Refreshing, relieving and lovely to know you can help out rather than being surplus to requirements. The saying ‘be kind, for everyone you meet is fighting a battle you know nothing about it’ is apt here. So rather than being jealous of the one who has it all, listen to them and maybe they’ll be generous enough to trust you with their reality and it will give you a little more perspective. The other perspective. The one who never says what you expect them to. They are nothing like you. They can drive you crazy. Their logic is an entirely different logic to yours! But they have an incredibly helpful way of making you think of things differently. Their views put you in another’s shoes and you are far richer in knowledge and life because of it. So who is your support? And who do you help support? 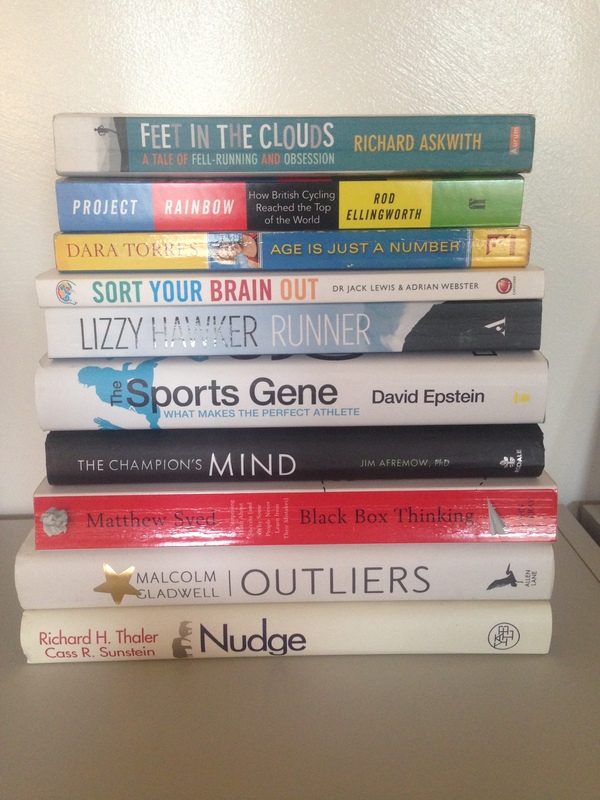 Great books on sports, psychology and performance. The Sports Gene – David Epstein – if you are in any way a sports and science geek this book has fantastic statistics, references really interesting research and includes interviews with some of the brightest brains in the business. One of those books you’ll find yourself quoting from for years. Black Box Thinking – Matthew Syed – a simple manifesto – that failure is needed to succeed. Brilliant use of case studies, exemplars and research to bring the ideas to life and leaves you feeling much more positive about screwing up. Runner – Lizzy Hawker – Talented ultra runner and talented writer. Written with such feeling and humility you can almost feel your legs tighten up as you read the miles alongside her. Warning: hide your credit card before reading so you don’t get inspired and enter an ultra! Nudge – Richard Thaler & Cass Sunstein – full on pop psychology – but a book you’ll keep thinking back to every time you spot a ‘nudge.’ How simple tweaks to things we do can make a big difference in behaviours. Can be used everywhere; to cut obesity levels through to increasing organ donations. Sort Your Brain Out – Jack Lewis & Adrian Webster – really simple (over simplified if you have any science background) but cute way to make you thing about the decisions you make and how to make your brain work harder for you. Faster – Michael Hutchinson – fabulously written, as funny as Dr Hutch’s books always are but full of cute stats and tips from one of the UKs best cycling time trialists. Project Rainbow – Rod Ellingworth – fantastic insight into how British Cycling and Sky fulfilled their objective to win the Road Race World Champs. The slight feeling that you are reading a job application and CV for the author is made up for by the levels of details and excitement you get reading – even though you know the result! Outliers – Malcolm Gladwell – looks at what those who sit far off the normal curve of success have in common. Suggests that it is not simply personality that drives people, but often their upbringing. Age is just a number – Dara Torres – An Olympic Gold Medal swimmer made a come back and raced in Beijing at the age of 41. She won 3 silvers. Brilliant advice on how to develop your training as you get older and never to use age as an excuse. Feet in the Clouds – Richard Askwith – regular guy, gets into fell running, takes on one of the toughest challenges of them all, the Bob Graham Round. The Champion’s Mind – Jim Afremow – A bit of a ‘DIY sports psych’ book but with great stories for how champions use those tools. More of a dip in and out when you need to know something than a read in one chunk but helpful if you can’t afford the time or money to get mental skills training. Any you’d like to recommend back? Welcome to November in the UK. Windy, rainy, slushy decaying leaves on the pavements and a temperature that switches from requiring gloves and a hat to full on sweat fest with about 2 minutes notice! If you’ve set the right goals, or you’ve got a challenge mindset, or enough intrinsic motivation, then heading out the door to run, cycle or trek to the gym in this environment can be just your thing. If you are not yet there then some inspiration may be necessary. Motivational memes and videos are a bit like Marmite. You love them or you hate them. If you hate them, then future blog posts on setting the right goals and another on motivating yourself through self-talk might help you more. But if motivational videos are your thing then some of the best I’ve found are below. Would love to hear which videos you have to get you out the door.